Leonard Nimoy, who played Spock on the original Star Trek TV show, has passed away today Feb 27, 2015, at age 83, from complications from COPD (Chronic Obstructive Pulmonary Disease). He will be missed by his 2nd wife Susan Bay, his two children, other family members and friends including former Star Trek co-stars George Takei and William Shatner. Below, a younger Leonard Nimoy in August 1967. Born March 26, 1931, in Boston, Mass., Leonard Nimoy began acting in movies and on television in the early 1950's. Below, a young Leonard Nimoy at the beginning of his film career, as street tough/boxer Paul "Monk" Baroni in Kid Monk Baroni (1952). Leonard Nimoy (Spock) was one of the original cast members in the Star Trek television series. Both his friend William Shatner and Nimoy suffered tinnitus as the result of an on-set prop-gun incident on Star Trek. Leonard Nimoy, along with other cast members from that series, later starred in the first 6 Star Trek movies (2 of which Leonard also directed). Leonard Nimoy's last appearance in a Star Trek movie was at age 81, in 2013's Star Trek Into Darkness. In addition to being a regular cast member on Star Trek, Leonard Nimoy was a regular on Mission: Impossible (1969-1971 season) as the characters Paris / Emil Vautrain / Gemini. 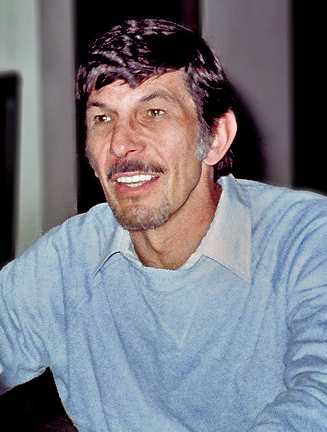 Nimoy was also a popular guest-star on other television series throughout the 1960s and 1970s. Below, a young Leonard Nimoy was Freddy on "The Ape" episode of Bonanza in 1960. Because of his olive-skinned complexion, Nimoy was often cast in ethnic roles. He played Native American Indians in guest-starring roles of 1950's & 1960's TV western series Broken Arrow, Mackenzie's Raiders, Tombstone Territory, Tate, Wagon Train, Death Valley Days, Daniel Boone, and Gunsmoke. 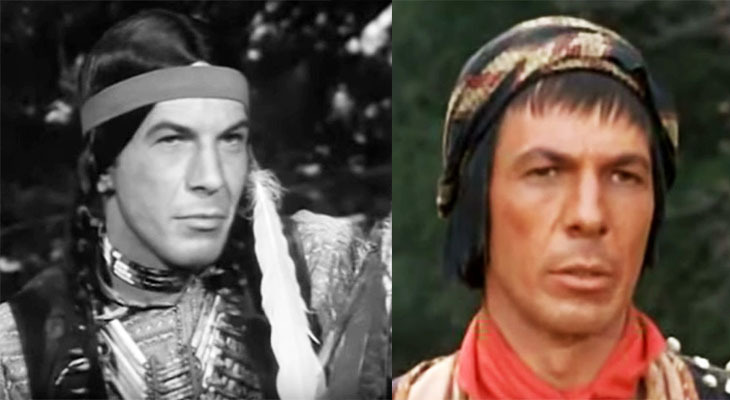 Below, Leonard Nimoy in costume on Tate (1960), left; and on Daniel Boone (1966), right. Leonard Nimoy was an active senior in his Jewish community - narrating a documentary in 1997, and publishing a photographic study in 2002. 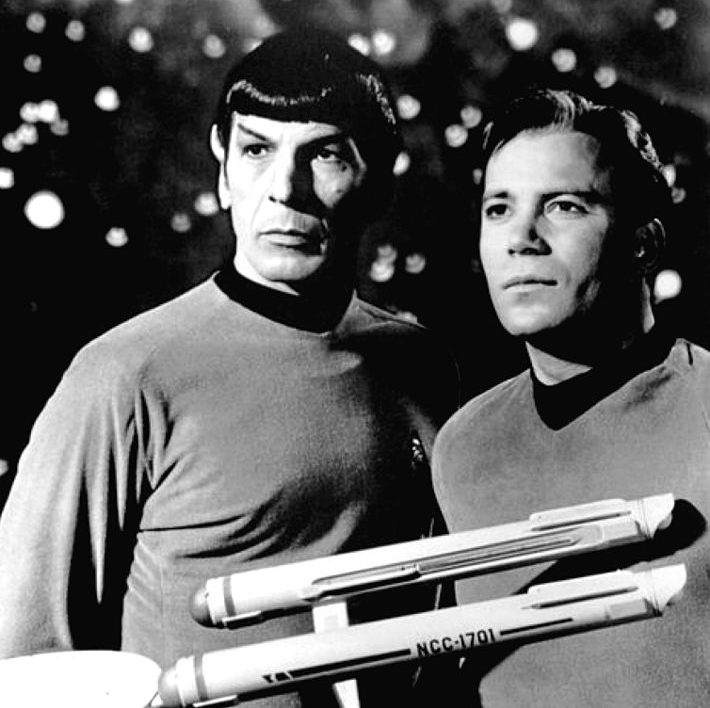 In 2010 the Space Foundation awarded Leonard Nimoy with a Public Outreach Award for "creating a positive role model that inspired untold numbers of viewers to learn more about the universe." Updated: March 2018 with additional content.